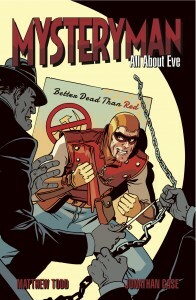 The creators of Mysteryman: All about Eve, Matthew Todd and Jonathan Case use a technique that while not unique to comics, is uniquely suited to comics because it is at least in part a visual medium and it has such a deeply recorded and remembered recent history. Todd and Case present their comic through Case’s artwork and other visual queues that are reminiscent of the Golden Age of comics, post World War II. With this time period, comes certain sensibilities and cultural memories that not only tell the reader what characters might be like but where the story might go. This same method is commonly used to establish genres as well but with both setting era and genre, overuse of stylization can become cumbersome, more about style than substance. However, Todd and Case don’t let that become a problem for Mysteryman. While they use style to establish the era of their title, they don’t abuse it, allowing the reader to feel the mindset that comes with the American time of anti-communist McCarthyism but not pigeonholing their book. 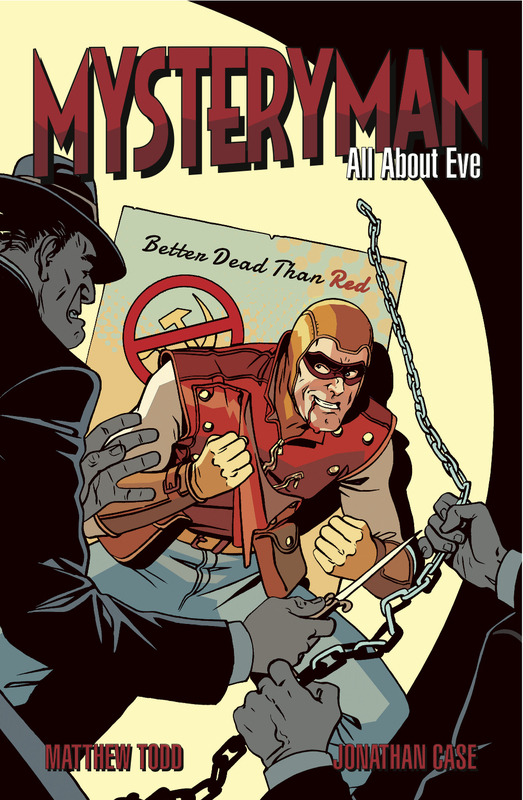 Todd and Case use All About Eve to tease the reader with a world that builds on historic comics, contemporary comics that reference the era but they also leave themselves enough space for incredible potential. In Mysterman, an interesting detail that Todd and Case use to milk their established era is to make their protagonist an actor. This sets up why he’s handsome, physically capable, has a flare for the theatrical in wearing a costume but it also explains why when he finds himself blackballed, he believes it possible for himself to be redeemed through vigilantism. Having Mysteryman be an actor is not only a wonderfully refreshing twist to the post-Watchmen post-modernism in comics but also creates huge potential for logical comic book fun and intriguing character relationships and decisions. This entry was posted in Columns and tagged alternative comics, epicdigital.com, jonathan case, matthew todd, sydnee davidson, whoismysteryman.com. Bookmark the permalink. Follow any comments here with the RSS feed for this post. Post a comment or leave a trackback: Trackback URL.